Remember a few weeks ago I signed up for another blog swap? I got my package yesterday! 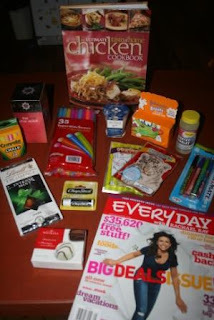 Want to check out the results of the blog swap (and see what I sent Megan)? Taste of Home, and Rachael Ray?! I am jealous! That is a really fun package! You gotta love the side walk chalk and bubbles for spring time! What great stuff! Blog Swaps are the best. I loved Everyday with Rachel Ray. My mom gave a 1 year subscription a couple years ago. Oooo I love the Taste of Home cookbooks too! Great package! What fun stuff! I also love Taste of Home cookbooks. I'm a sucker for any of them they put out. you got a great package too!!! I love Taste of Home too! Of course, I usually stick to the "simple and delicious" recipes, because I'm lazy like that. Sounds like a swappy success to me! ooo! i love Taste of home too! Fun stuff! Yea for swapping!! i have the tast of home book...awesome!! yo will looooove it!! i am giving away a $25 Target gift card on my blog come enter! What a great box of goodies! 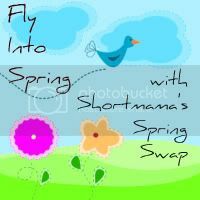 I am a swap junkie now too!